Asthma in a bakery: An allergy to flour dust can mean an end to the existence of a baker if he does not do anything about it. If he ignores his symptoms, his allergies and asthma only gets worse. Asthma in a bakery: An allergy to flour dust can mean an end to the existence of a baker if he does not do anything about it. If he ignores his symptoms, his allergies and asthma only gets worse. Today, there are fortunately several technologies which will help him with his allergies. Every sixth baker is affected by an allergy or occupational illness due to flour dust. The danger is invisible and insidious. Once an allergy develops, it cannot be reversed. As described in the earlier part of this article “Dust: Hazard of Asthma in Bakeries”, there are several ways to diagnose an allergy to flour dust. Which special technologies can help a modern baker avoid asthma whilst working and also minimize the exposure to flour dust? For this we need to know the causes in a bakery. In a modern bakery the proprietor must not only know the reasons and origins of occupational illnesses like asthma, bronchitis, lung disease and skin diseases caused by exposure to flour dust; in addition he must provide state-of-the-art technology regarding cleanliness and fresh air in his premises. An investment in this technology safeguards his existence and the health and safety of his employees. Which factors are responsible for asthma in bakeries? The highest dust concentrations occur pouring flour into the mixer and at the beginning of the mixing process. 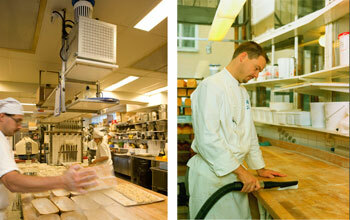 The released dust distributes throughout the whole bakery and can cause asthma. Recommended technology to be used at the mixing machine: installation of a source extraction system to the dough mixer. Prior to filling tins and baskets with dough or hand working on tables, the surfaces have to be powdered with flour. Due to the high frequency of this activity over large areas the respirable dust will be distributed evenly in the air and is inhaled by all employees. Recommended technology to minimize asthma whilst powdering: use self-made dust free flour produced by a separator or purchase flour with additives and make use of an efficient high filtration air cleaner. High concentration of dust occurs due to short filler hoses. Advice: use a longer filler hose and/or source extraction system. To establish the necessary consistence of the dough, flour dust is metered manually and flour dust is released into the environment. This can lead to the development of asthma. Advice: use dust free flour and/ or a source extraction system. These are items in a bakery which are often heavily contaminated with fine dust. If these are heavily handled or thrown, fine dust will be released and will float for a long time in the air. This environment is also responsible for asthma. Advice: cleaning of items and dusty surfaces with industrial dust extractors equipped with micro/HEPA filters or with a central vacuum system. Sweeping with brooms in a bakery is definitely out of date and is no longer acceptable practice. It is the cause of very high dust concentrations in the air. Whilst sweeping, you actually just whirl up the dangerous fine dust and redistribute it, which contaminates the whole premises. Here, the danger for asthma is especially high. 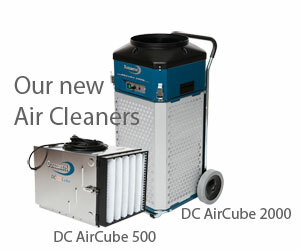 Recommended technique: cleaning and extraction of dust with an industrial dust extractor equipped with micro/HEPA filter or use of a central vacuum system.